Being a Leica, the X Vario is built better than some other cameras to a most satisfying degree. It feels solid without being too heavy and its controls move precisely without any play. Incorporating a zoom lens has made the X Vario larger than the X1 and X2. Yet while you won’t be putting it in your pocket, it will sit comfortably in a small bag and is easy to carry around all day. I found it to be a very discreet camera that didn’t attract unwanted attention. Despite its (typically Leica) boxy shape, the X Vario is comfortable to hold, both at the eye and in live view mode. The minimalist design is lovely to work with and doesn’t detract from the picture-taking process. The top of the camera is home to a traditional shutter-speed dial featuring speeds from 1-1/2000sec, with speeds longer than this accessed through a thumbwheel on the back of the camera. Apertures are controlled in 1⁄3-stop increments by a smaller wheel. The shutter release is surrounded by a power switch that selects shooting mode – single or continuous. The M-series-like design continues with the zoom and focus controls, both of which are barrels on the camera lens. The manual zoom is fast and intuitive to use, more so than motorised zooms, and I loved using it. The focus ring is well designed, too. The scale runs from 0.3m to infinity, beyond which is an AF setting that sets focusing to automatic. This means that coming out of AF to focus manually just requires a simple turn of the focus ring, which can be done with the camera at the eye. The back of the camera is more compact-like, but still minimalist in design. A 3in, 920,000-dot screen dominates and is flanked on its left-hand side by buttons that provide access to the main menu and quick menus for adjusting focus mode and ISO. The only real handling problem is the camera’s four-way joypad controller that is used to navigate menus and scroll around magnified images. The up, left and right keys also provide quick access to exposure-compensation, self-timer and flash-mode options respectively. While the joypad control itself is fine, it is situated in exactly the right place to be activated by the palm of your hand when holding the camera. I found myself on the self-timer or flash-mode menu screens several times while holding the camera with one hand. 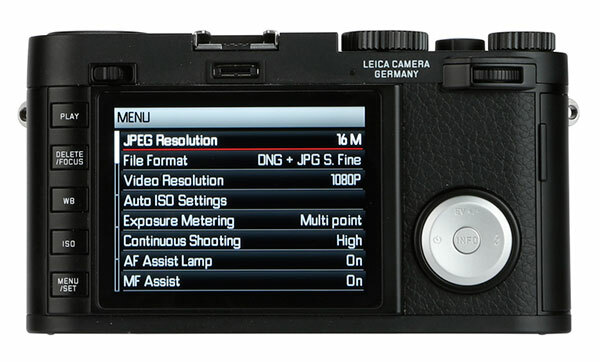 Additionally, while every other joypad in the world uses a button at its centre as the OK or set selector, Leica has chosen not to do this, instead combining ‘set’ with the menu key on the far left of the camera. The centre of the joypad is instead marked ‘info’ and provides shooting data overlays while shooting and reviewing. This is frustrating because using the joypad and the menu/set button requires two hands. Furthermore, the menu/set button isn’t always the key that accesses menus – the right joypad is sometimes used. Confused? You will be! All this could have been avoided by moving the set key to the centre of the joypad, making the menu button single-use, and having info on the down joypad hot key. However, this really is the only problem on an otherwise well-constructed camera that is highly enjoyable to use.